A stand up comedian, from Bangalore, a year or so back, cracked a "jokes", "You take a guy from Bangalore and put him in one of your five pubs in Chennai....................." He wasn't very funny even otherwise. Chennai has come a long way since then and pubs are mushrooming all over. However only a few of them stand out though. Maybe the comedian was right. And Plan B will probably be one of them. Sometime back, my friend asked me if I had the steak at Plan B. I was like, what? Where is that? "You're a foodie? Really?" she snorted. And ever since then I've been wanting to try out Plan B, but never got the chance to, until last Friday. The place was packed to the brim so the three of us got seated right at the very end, next to the bar. And the fun began. 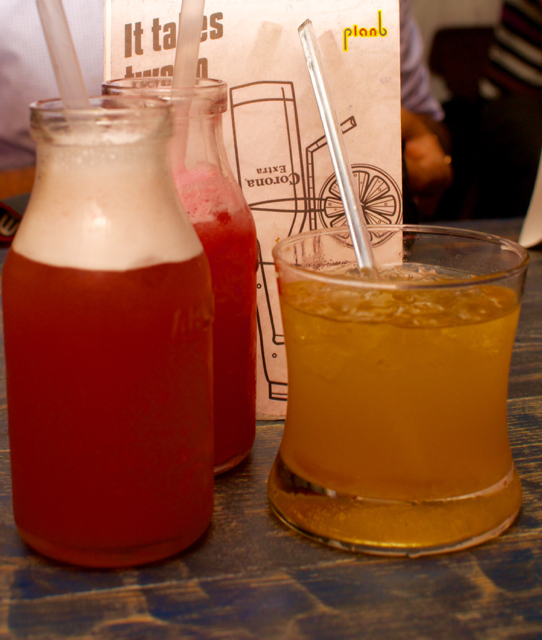 It all started off with the two mocktails and a whisky marmalade which my friend was praising all through the week. Apparently it was fantastic. I wouldn't know. My mocktail wasn't great. And then three fantastic starters as we were ravenous. Loaded Potato Skins! Yum, would be an understatement. It had a sort of crispy sogginess and loaded with chicken. They're quite generous with their meat as we found out during the rest of the meal. Beef Chilli Fries. While I would have liked fries loaded with beef chilli, this was the other way around. 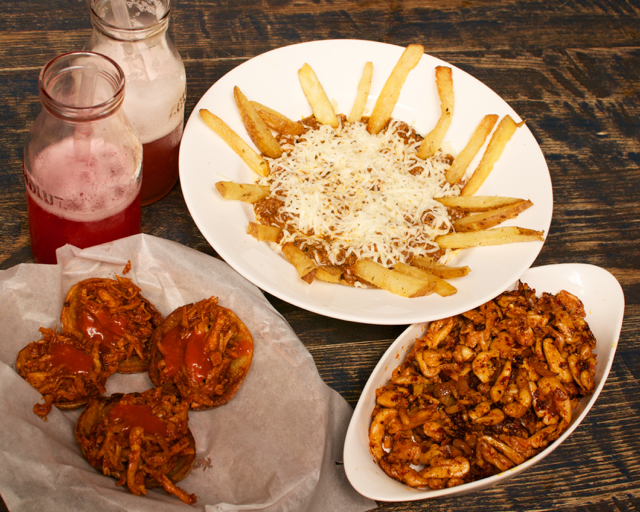 A handful of fries loaded with beef chilli. Again. Loads of meat and apparently the fries are just meant to keep dipping into the beef chilli. And another fantastic starter, the Fiery Chicken. While I loved it, our drinker friend was getting happier . Not sure if it was the whisky speaking, but he was like, "man, this is like the perfect side dish," spicy and juicy and yummy he went on, till the main course arrived. The burger arrived. Called the Jucy Lucy, it was presented extremely well. My whole body started to salivate just looking at the burger. 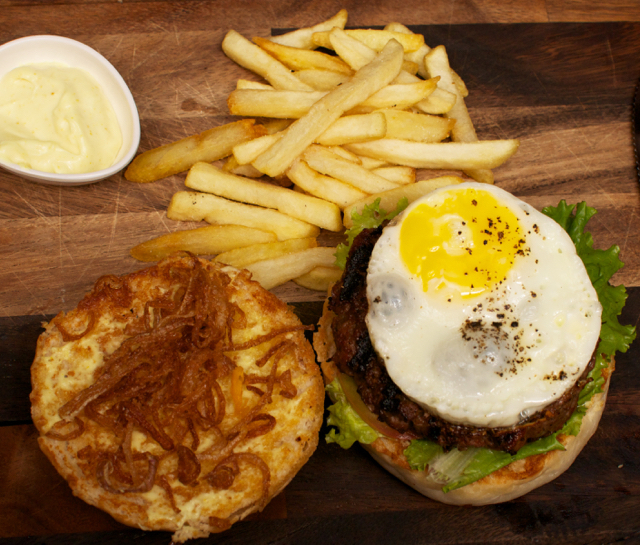 The patty looked nice, the bun had crispy onions on it and the egg was inviting. Slowly, I took the bite. And. Then. It. Came. The disappointment. The burger, though called the juicy lucy was a little too dry for my liking. I should have ordered the one that had beef chilli on top of the patty. The Beef Steak was the exact opposite. Loaded with beef, it hid a beautifully smooth potato mash beneath it, the plating wasn't great, but the beef was just excellent. 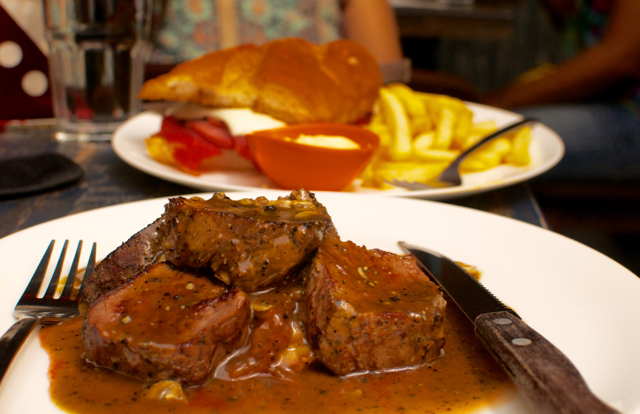 It was juicy, yummy and the sauce was very complimenting to the beef. Loved it. "What's a sandwich that doesn't have ham and cheese," said our drinker. He enjoyed his ham and cheese on his own as the other two don't eat pork. He was all praise for it!!!! 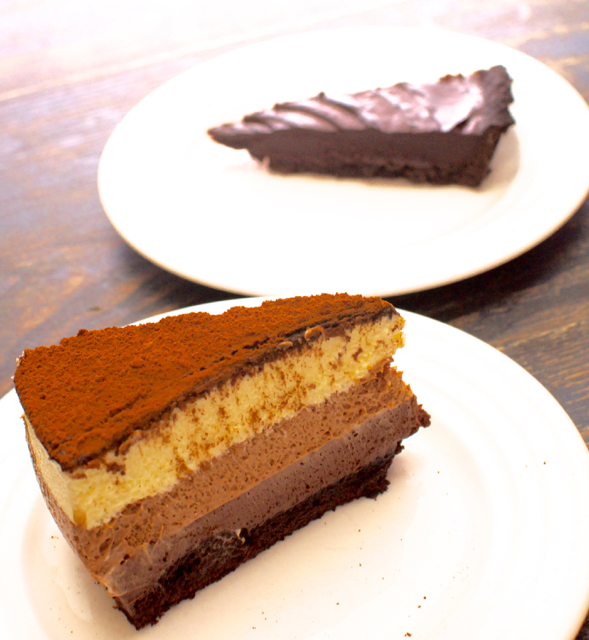 They have only two desserts, a 6 layer chocolate cheese cake and a chocolate tart cake. I can't believe I forgot the name of the chocolate cheesecake. Its a crime because it was decadent. The chocolate tart cake was fantastic, but the other one was just a tad better. Actually, no. Both were equally good. Actually no, the tart was better. Okay, final verdict. Both were excellent. The pricing here is brilliant. A superb steak for about Rs. 350 bucks. A meal for two without drinks can be had about 1k or so, which is brilliant, considering the ambience! Rustic, music filled, happening and seems to be some sort of a melange between a loud bar and a quiet pub!!! Nevertheless, a great place for a Friday evening once you navigate the nasty road to get to it!! Plan B is off Greme's Road, Egmore. Take the road opposite Sea Shells on Egmore and you'll see the sign boards.